COLUMBUS, Ohio – Isaiah Salinda shook off a three-putt bogey on the first hole to fire a brilliant 8-under-par 64 on Tuesday morning in the opening round of the 115th Trans-Mississippi Amateur Championship at Brookside Golf & Country Club. After a weather delay for heavy rains and lightning in the area washed out the afternoon action, Salinda holds a two-shot lead with half of the 144-player field yet to finish their first round. Play was suspended for the day at 4 p.m. local time. The first round resumed Wednesday at 8 a.m., and the second round will follow directly after it concludes. Following the second round, the field will be cut to the low 54 scores, including ties. 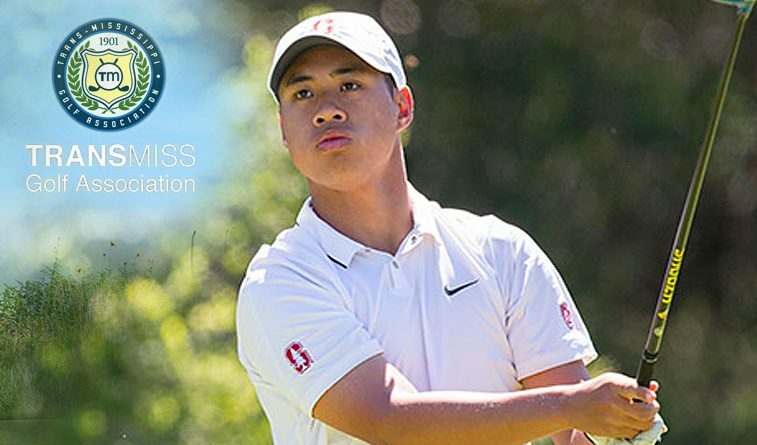 Salinda, a Stanford senior from San Francisco, quickly made amends for his early stumble. Starting on the second hole, Salinda reeled off four straight birdies and made a total of nine of them over the next 17 holes to stake his lead. It was good enough for a two-shot cushion over Justin Tereshko from Lexington, Ky., and Pierceson Coody from Plano, Texas. They both turned in 6-under 66s to share second place. Among players in the field with Oklahoma ties, former Oklahoma State player Sam Stevens of Wichita shot 2-under 70 and was tied for 16th. Oral Roberts golfer Cody Burrows of Chickasha and Oklahoma Sooner Quade Cummins of Weatherford each shot even-par 72 and are tied for 58th place. Draegen Majors of Tulsa shot 1-over and is tied for 80th.